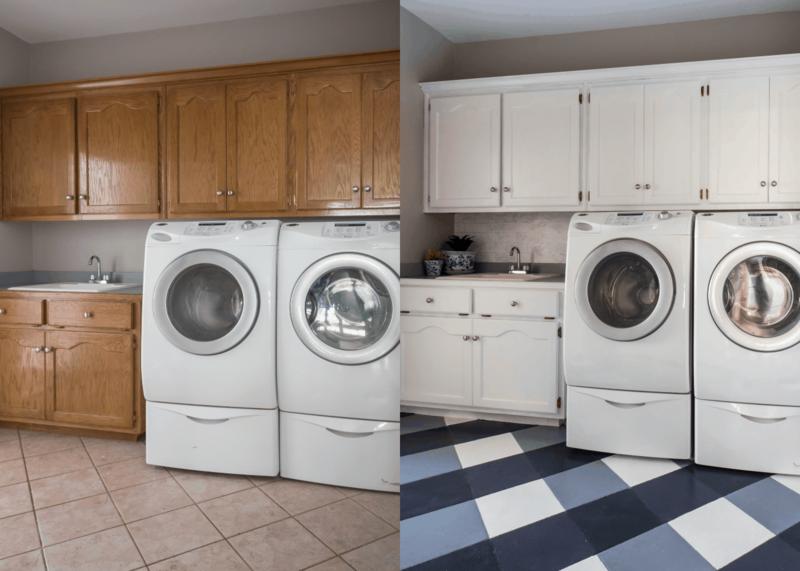 It is reveal day and I am so excited to show you my $100 Room Challenge-Laundry Room! I want to thank Erin from Lemon’s, Lavender, and Laundry for creating this challenge. We have to makeover a room and we can not spend more than $100 for this challenge. I spent $36! 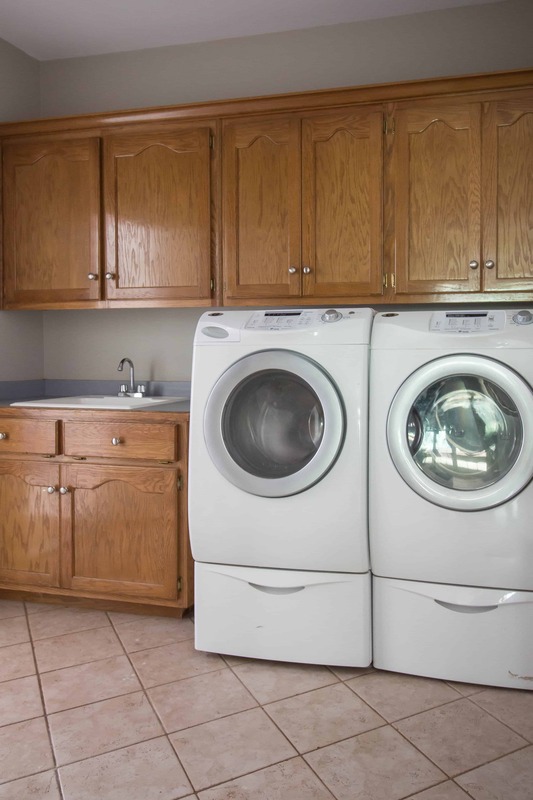 Let’s look at my laundry room before. Now, let’s look at the before and after side-by-side. I love doing laundry in there now. That’s a lie but I do enjoy walking in my laundry room now. The best thing about this makeover is that it I spent under $40 because I did everything with paint and I am going to tell you how much it will cost to do these projects yourself and it is under $50. You can do these projects even if you are not gifted in art. Visit the blog post to see how. 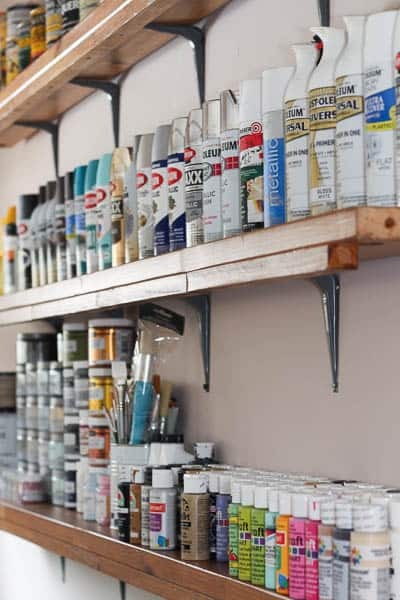 DIYers always have a fabulous paint stash which is usually from leftover projects. 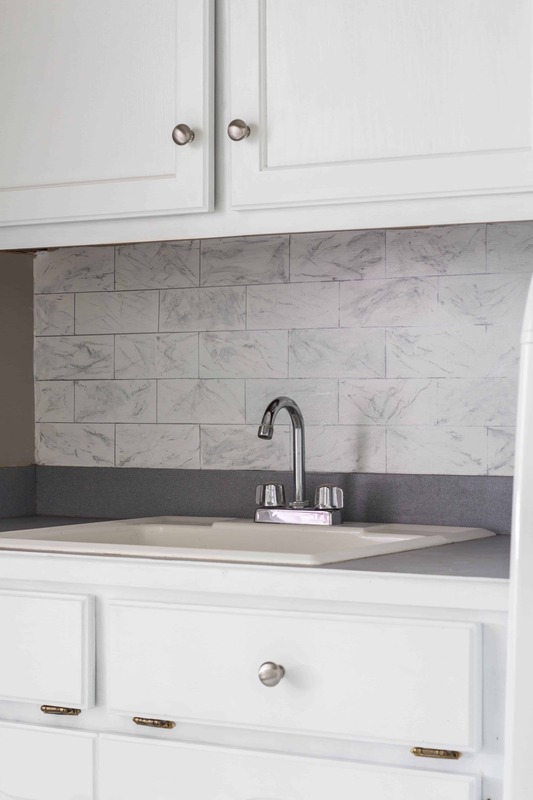 I needed a backsplash but I did not want to spend any money so I did a Faux Marble Subway Backsplash and you can visit the post for the tutorial, supplies, and to see how I reused items that I had in the room. Total spent $0. It will cost around $8 plus a piece of scrap board to do this project if you have to purchase supplies. 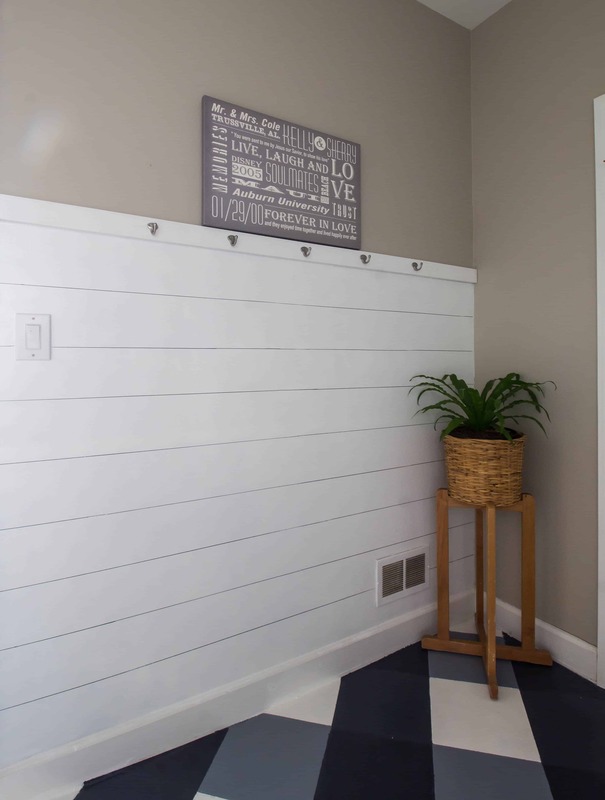 Visit Faux Shiplap Wall for the tutorial and supplies. $0. It will cost $3 to do this project if you need to purchase the supplies. The floor is where I spent my money. The natural stone tile floor is over 10 years old and it needed updating. I have seen so many beautiful painted floors using stencils but I wanted to do something very different and I did not want to purchase a stencil. I have seen Better Homes and Gardens share how to paint buffalo plaid on a floor and I thought that it would be a fun project. Visit my How I painted Buffalo Check Floors to see the very important tips if you want to do this project yourself. I purchased Glidden Gripper Primer $10. I purchased Valspar Porch Paint in a dark blue and white for $13 each. You need four colors so I mixed the dark blue and white to make two of the colors. Total spent $36. I love how thick the porch paint is and it dries almost immediately. I have never painted with anything like it and I feel like this will hold up well. I will update soon. You can view the full tutorial for How I Painted a Buffalo Check Floor. If I would have had to purchase all of the supplies, it would have cost me $47 plus the cost of paint for the cabinets. Lol. We have some of those old ugly oak cabinets too. It’s amazing how much nicer a room can look once you’ve painted them. Love all your other touches like the faux shiplap. Great job! I am DEAD. I am not this bold in my own house but LOVEEE to live vicariously through you and see these floors every day. I know you’re loving it already. GREAT job! I am OBSESSED with the floor update!!!! What a GREAT idea!!! Can you plz direct me to the post that tells what paints you used for your kitchen cabinets? I have that oroject facing me and have out it off because I am u sure if what product would hold up best. WOW! Your before picture looks just like a kitchen I picked out for our former house, oak cabinets and a beige tile floor just like that. What a fantastic update, and so affordable!!!!!! This truly attests to the power of paint and creativity! Awesome job. 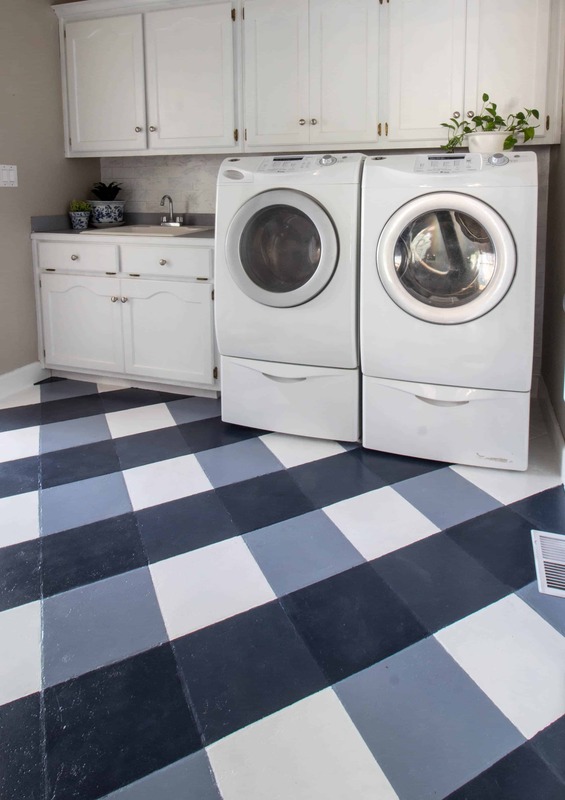 The laundry room looks fantastic. I’m so inspired by what you achieved here for only $36! The floor really brought it all together and am interested to see how it holds up for you. Looks beautiful. Wow Sherry! that is a miraculous transformation! I can’t believe you did it on that tight of a budget. The floor totally steals the show! You are so creative. 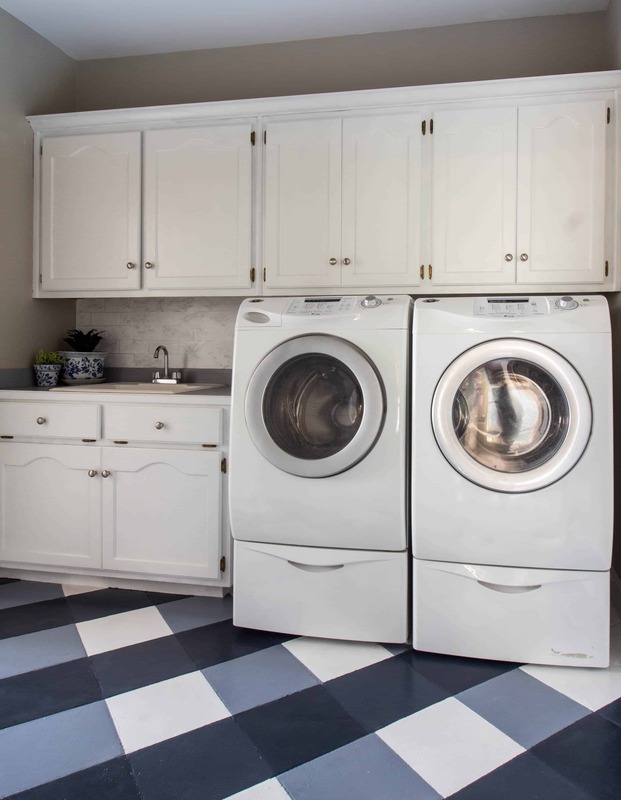 I’m jealous of your laundry room! Paint is seriously one of my most favorite DIY tools too!! Your space turned out amazing!! Love the floors and I definitely want to try something on my office floors this year too. Ohhhh I love it! What a beautiful refresh! And I am also jealous of that budget! that buffalo floor!!!! wowowowow I love it SO SO Much! great job! This is fantastic! Such a dramatic makeover for so little money. I am in love with the floor! Would love to know how the paint on the floor holds up! 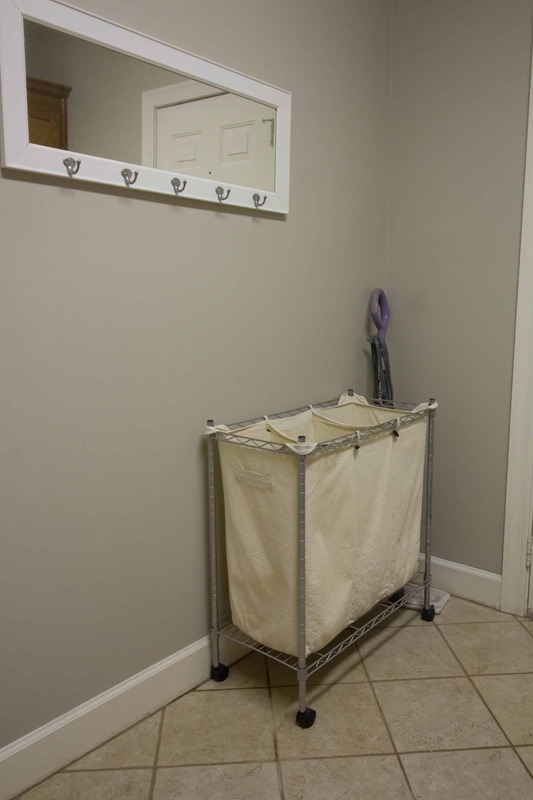 We have a small powder room I did for the last $100 Room Challenge, but I’m not a huge fan of the beige color. Oh, my those floors!!! Great job. I love the power of paint and you proved just the impact it can make. Congrats! Sherry! That floor!!!! It looks fantastic my friend…you hit the ball out of the park with it, the paint on the cabinets and the shiplap. My jaw is on the floor with this makeover! I cannot believe you did everything for less than $40! That is CRAZY!!! The cabinets looks absolutely gorgeous, but the floor is what I love most. It looks fabulous! I am so glad you decided to join the $100 Room Challenge for another round!!! 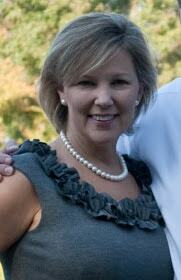 Wow, Sherry what a transformation! The floor looks so good along those white cabinets! Congrats on an amazing makeover with a small budget. It is beyond amazing – the whole transformation! That floor is a show stopper! Well done my friend.